An important decision in the hardwood buying process is the type and grade of hardwood to use. As there are many different options available, making the right choice relies on a variety of factors. When trying to decide on the type and grade of hardwood to use for a home or business, it is important to consider the construction type, the species, the installation type, whether the wood is prefinished or unfinished, and basic style and color options to suit décor needs. The standard thickness for solid hardwood is 3/4″. For thin profile solid hardwood, 5/16″ is the standard. The planks are sawn in one of three ways, which affects the stability and the price of the hardwood. Flat or Plain Sawn: by far the most commonly used cut. It contains more variations than the others. Quarter Sawn: cuts a log into quarters before it cuts the strips of wood to make hardwood flooring boards. Rift Sawn: cuts a log at a different angle than quarter sawn before it cuts the wood into hardwood flooring boards. Though it is more expensive than the other methods, it is also more stable, providing higher quality flooring. Solid hardwood floor planks are made with a tongue and groove edge locking method which makes it easy to join the planks together and make a strong joint. One side of the board has a tongue and the other has a groove. The tongue interlocks with the groove to fit the boards together. One of the advantages of solid construction is that most 3/4″ thick solid wood floors have about 1/4″ or 6 mm of wood above the tongue and groove, meaning they can be sanded and refinished many times. If properly cared for, a solid hardwood floor can last for generations. There are some potential disadvantages of solid hardwood. It cannot be installed below grade or over radiant heat. Most experts recommend not installing it over a concrete subfloor. And finally, it tends to be pricier than engineered wood flooring. Engineered hardwood is made by gluing a real hardwood veneer to a core board made of either plywood or high density fiberboard. Because of this construction method, engineered hardwood is more dimensionally stable than solid hardwood. In other words, it will not contract or expand as much due to changes in humidity or temperature. The number of plies used to create the plywood core may vary anywhere from 2 to 10, and while a 3 ply board is not going to be as stable as, say, a 5 ply board would be, this difference is not enough to be a deciding factor unless the flooring is going to used over a radiant floor heating system. Generally speaking, the more plies in the plywood, the higher the price. A high density fiberboard core is more dimensionally stable than a plywood core. Dry solid-sawn: involves letting the wood dry out slowly with a low humidity level to keep moisture from inside the wood cells intact, reducing the risk of cupping. It is the most expensive type of engineered flooring, but looks and acts more like a solid. Rotary-peel: involves boiling the log for a certain amount of time at a certain temperature to prepare the wood. After the wood has been prepared, it is scraped from the log with a blade working from the outside in and then pressed flat. Rotary-peel typically has a plywood-like grain and can have issues with cupping and warping to try to revert to its original shape. Sliced-peel: involves boiling the log for a certain amount of time at a certain temperature to prepare the wood. After the wood has been prepared, it is sliced from the end and then pressed to create a veneer. The thickness of the veneer ranges from 0.6 mm to 6 mm. The thicker the veneer, the more expensive the flooring is, generally speaking. For people who are planning to refinish the flooring at some point, it is important to consider the thickness because, unlike a solid hardwood floor, the engineered type can only be sanded and refinished so many times. The thicker the veneer, the more times it can be sanded and refinished, however, it is still limited. Once installed, removing a vent to inspect the flooring from the side can provide an idea of the remaining thickness on the veneer. Note: Sanding and refinishing an engineered wood floor with a veneer thickness of 2mm to 2.5mm is best left to a professional. Engineered floor planks are made with either a traditional tongue and groove edge locking method or with a glueless click-lock edge method that requires no glue and allows the pieces to snap together to create a snug fit. This is the easiest do-it-yourself installation method. Acrylic impregnated floors have acrylic compounds injected directly into the wood, resulting in a stronger, harder, more durable wood. While these are more commonly seen in commercial settings, this kind of floor may do well in a busy home with lots of traffic. These floors can handle more moisture than the standard hardwood floor as well. While not a different construction type, these wood floors are unique in that they have been made from reclaimed wood. The wood may have been reclaimed from sunken boats, from logs salvaged from lakes and rivers or from old buildings and reprocessed. This type of flooring is good for those who want sustainable flooring, and can be found either of solid or engineered construction type. This is an interesting area for shoppers, retailers, and manufacturers because there is no universal grading system in place. While the National Wood Flooring Association, or NWFA, has established a grading system, it only applies to certain domestic species. For photos of grading, click here. It is important to note that grading typically refers more to the look of the floor versus the quality of the floor. For example, an antique-grade floor is just as structurally sound as a floor graded as select and better. The antique floor will have more of a rustic look to it with more character marks. Many manufacturers create their own grading systems which apply more to the look of the wood than the strength, stability, durability, and quality of the flooring. When it comes to engineered hardwood, most sellers do not make grading information available. Clear Grade: This is the best grade of hardwood flooring because there are few color variations, board lengths are not widely varied, and there are little to no visible knots or pinholes. Select and Better: This grade is slightly lower than the clear, still presenting uniform color and little to no knots and pinholes. #1 Common: This grade presents with more color variation, shorter board length with greater length variation, and an increased chance of visible knots and pinholes. #2 Common: Boards show natural character, with darker and lighter boards, shorter board length, with an increase in visible knots and pinholes. Cabin Grade – Cabin grade is for those who are looking for a rough-hewn look in hardwood flooring; allowed checking, unfilled knot holes and worm holes, no splits, no loose knotholes. Shorts: This has the most visible character with many knots, pinholes, and color variations present. Country or Exclusive Grades: This grade presents with more color variation, shorter board length with greater length variation, and an increased chance of visible knots and pinholes. Traditional, Antique, Character Grades: Boards show natural character, with darker and lighter boards, shorter board length, with an increase in visible knots and pinholes. Tavern or Cabin Grade: This has the most visible character with many knots, pinholes, and color variations present. It is worth noting that some sellers combine grades. For example, a floor may be sold as #1 common and better, meaning it is a combination of #1 common, select and better and clear grades. In this case, you will want to find out from the seller the proportion of each grade. Prefinished boards are finished by the manufacturer, using several coats of finish with aluminum oxide, a surface coating which is the second hardest substance in the world, next to diamond. Special equipment dries the finish almost instantly, creating a durable surface for people to walk on. These are more expensive than unfinished floors, but can be installed in the home without having to worry about sanding and finishing. Site finished flooring is unfinished hardwood installed on the site and then finished. These boards cannot use aluminum oxide, because by the time the finish dries (several hours in some cases) the aluminum oxide particles will sink to the bottom, therefore not providing a hardened surface for people to walk on. There are several other durable finishes and sealers to choose from. The following species are some of the more popular domestically grown and processed: White Ash, Beech, Birch, Black Cherry (aka American Cherry), Hickory-Pecan, Sugar Maple, Mesquite, Red Oak, White Oak, Pine, and American Black Walnut. The following species are some of the more popular exotics, imported from other countries: Bamboo, Brazilian Cherry, Bubinga, Cork, Cumaru, Spotted Gum, Sydney Blue Gum, Iroko, Jarrah, Mahogany, Brazilian Maple, Merbau, Tasmanian Oak, Padauk, Purpleheart, Brazilian Teak, Thai Burmese Teak, Brazilian Walnut, and Wenge. There are many other design options that need to be considered, including: color, gloss level, finish, edge detail, width and length. For more information go to Colors, Finishes & More. What kind of hardwood will work best for your renovation project? 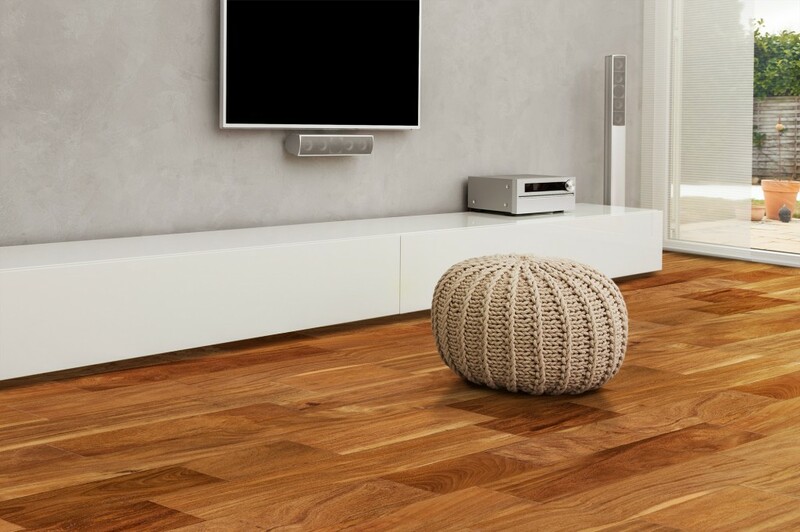 Click here to browse our online selection of stunning wood flooring. Add an inspired look to your decor. 8 Did you find this article helpful? We have ceramic tile in our kitchen and I want it out! If they take up the tile, would it be smooth enough to lay engineered hardwood on the concrete backer board? I am looking at replacing tile floors with hardwood. Can u tell me if the subfloor would have to be completely replaced due to the tile mortar? Or can the subfloors just be cleaned up? Just purchased a house. That has tile all through out the house and no windows for natural light.. I do not like grout. And I am having a hard time trying to find the correct flooring for the house. Could you give me some ideas??? Please. If you’re looking to find a style of floor that can be installed over your tile, then engineered floors, laminate, vinyl plank, and LVT tile are all viable options for you. These types of floors can generally be floated over a flat, clean, dry substrate which can include tile. For the light question, you might want to consider going with a brighter color spectrum when choosing your flooring. It may not replace a lot of actual natural light, but lighter colors tend to reflect what light there is in a space, and to help make that space seem larger, too. I am considering a eucalyptus floor for an space that will not be heated. It will be floating. And there will be a vapor barrier under flooring. Is this a good choice in a cold climate? If you’re going to float the floor then I assume this means you’re going with engineered wood. Where the core layers in the boards will help them to manage temperature changes, it’s still a good idea to maintain a constant and moderate temperature in any room that features a real wood product. Also, moisture levels in dry cold climates can be an issue, too. If the air in your space is particularly dry, a humidifier can help restore the balance. Why is the premier olivewood hardwood flooring on clearance? Has it had issues? I’m building a new home and would like radiant heat – especially with cathederal ceiling areas. I wish to install hardwood in most areas except the bathrooms, what type of flooring should I be looking at? Dear DIYGuy…. I am in the process of building my home and have been researching everything and I have found you can find negative reviews about EVERYTHING… Take them with a grain of salt and remember that most people who are thrilled with a company… Rarely take the time to write a review. So by and large you will find many more negative reviews with a few positives sprinkled in if someone goes above and beyond. That being said… I truly appreciate the knowlede and expertise this site has expressed to me. It is making the daunting task of figuring out which wood would be best for my application so much easier. I have no idea where I will end up purchasing my flooring, however, I feel so much more informed now, so when I get “the sales pitch” from a store I will know how much to believe. Thank you Build Direct…. You are greatly appreciated. I have just had new hardwood floors installed and am questioning the random holes I see. I realize some of this is the nature of hardwood. The floors are red oak finished with dark walnut stain and satin finish. They are beautiful but have quite a few holes. They say they can fill them and stain but will that look natural or like a filled hole. There is only one other area that bothers me and it is an irregular board at the corner of a bedroom door. I just don’t know how particular I should be. Can you give me any input? Why are there so many negative reviews of you guys.. most of them complain about quality and customer service. try googling BuildDirect reviews. I have kitchen oak floor 18 hrs old and damaged. Is it better to sand and polyurethane or put new hardwood after ripping old floor? I thought new modern woods are better . Does the lifetime warranty or 25-50 year warranty mean it will last that long? Has anyone used or heard of acoustic adhesive (all in one glue and membrane), for example Supex Bond Platinum Plus? My flooring guy is recommending this for the installation of engineered hardwood in my condo (4th floor)…apparently has IIC rating of 63 and would satisfy the condo association’s requirements. This means I would just need to glue the wood to the concrete, would not need to glue membrane to concrete, then glue wood to membrane. Is this product truly soundproofing? I have some plain sawn walnut boards cut from area trees, planed to 3/4″ and drying in a climate controlled building for two years. I’d like to use them for flooring in a cabin-an older cabin look is desired. Some of the boards are over 12″ wide. Should I rip them narrower before nailing down? They are not tongue and grooved, if I cut a kerf in the bottom, will that help prevent cupping? I’m not looking for a perfect finish look, but an older cabin look. How can i determine the density of the core? I am being told that a industry standard code is used to determine the density of the core, but i dont know what that is. I am installing mahogany on top of a plywood floor. I am glueing it and nailing it. The wood only has the tonge and groove on the long sides and not on the ends. Do the ends need any special application? You mentioned that you are going to both glue and nail down your hardwood floor. Most installation instructions will list suitable install methods eg. naildown/gluedown but would not suggest both. I would double check before you start installing that this will not effect the warranty as most warranties will be void if you do not adhere to the installation instructions. As far as the ends of the boards are concerned, there are no special requirements as such. We have prefinished cabin grade solid oak floors that have been down in our house for almost two years. We are noticings lots of areas show up with cracks and pieces flaking off…almost like the finish is no good. I have had the company that the floor was purchased and installed from come out and look at the floor and they said it was because it was cabin grade….is that correct!? Doesnt seem like we should have such issues after such a short time. The is fairly accurate. Cabin grades can have filled knot, worm holes and cracks that are filled, and that is why it comes with no warranty. The flaking may be because of the grade or it could be the finish itself. What I would suggest is maybe get a second opinion from an other installer or from a certified flooring inspector. Fitting a hardwood floor is a major undertaking and you need to make sure you are fully prepared. You’ll need the tools, adhesives and finishing products for laying engineered hardwood floors but please be aware that laying a solid hardwood floor is a different matter. We strongly advise you use a qualified solid hardwood floor trades person for laying a solid hardwood floor as the concequences of an ill fitted solid hardwood floor can cause serious damage to your home or property. Hi, My 12 ft living room walls are covered in knotty honey stained pine smooth paneling. The trim around windows and doors are the same. We are looking at hardwood floors and I am beside myself trying to make a decission on a color. I don’t want it to be anymore darker than it already is. Do you have to stay with the same tone as the walls? The room size is 24 x 15 with a 6 ‘ wide dark red fire place. Have any advice? Hi, my salonfloors needs replaced. Existing floors are laminate from a home center store ,installed 2003. has not held up well to traffic and condition. I am on a very tight budget in this economy. I prefer wide boards, medium to not to dark. I think engineered hardwood can work best, for duribility. I saw a hardwood called Birch Texas, $1.99 sq.ft. I need to cover 1700 sq.ft. Do you sell cieling tiles & bathroom floor tiles. I am thinking of installing hardwood floor in our kitchen. I’ve seen articles that advise not to do so. What would you recommend? I am thinking of doing my staircase and landing in wood. Would you recommend solid hardwood or engineered hardwood, and why? I live in Oklahoma. I’m hoping to hear from you as soon as you can get to it. Thank you for any information/advice you may give. First, with solid, you’re best to install it in an interior that is environmentally controlled, is above ground, and will be fastened directly to the substrate (your staircase in this instance) by way of nailing. If these are the conditions of your installation, solid is certainly viable. If not, I’d ask about engineered, which still uses a real layer of wood, and therefore still delivers the effect you’re after, if not the extra structural support that solid would lend to your property. Which would be the best quality of wood flooring for a bedroom near a bathroom? There would be a number of factors to take into consideration. I would assume that the bedroom would be on the ground floor or the upper floor of the property, otherwise you’d be safer to stick with engineered, laminate, bamboo, or cork rather than solid hardwood. Second, moisture is going to be your main concern with a wood floor next to a bathroom area, particularly at the doorway from bathroom to bedroom. I’d suggest a mat of some kind, which ever floor you choose, to absorb excess moisture from the bathroom. If the mat gets very wet, dry it out and don’t let it sit on the surface of your floor. And keep your fans running while you’re taking showers and baths to keep steam out of your bedroom. Run them for about 20 minutes or so after showers, just to be sure. Quality floors are generally moisture resistant. But, the more care you take the better. Hope that helps, and enjoy your floor!